Ground Floor. Queen bed in master, Queen bed in the second bedroom, and a full-size sofa sleeper. 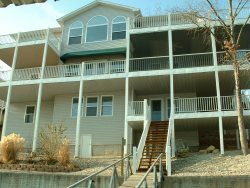 Includes full kitchen, TV/VCR/cable, stereo, and gas grill on the lakeside balcony. Unit offers 12x24 boat slip for an additional fee.